No purchase necessary. Only one entry per person is permitted. Entry to the competition is conditional on acceptance of these terms and conditions. By entering you are deemed to have read and accepted these terms. 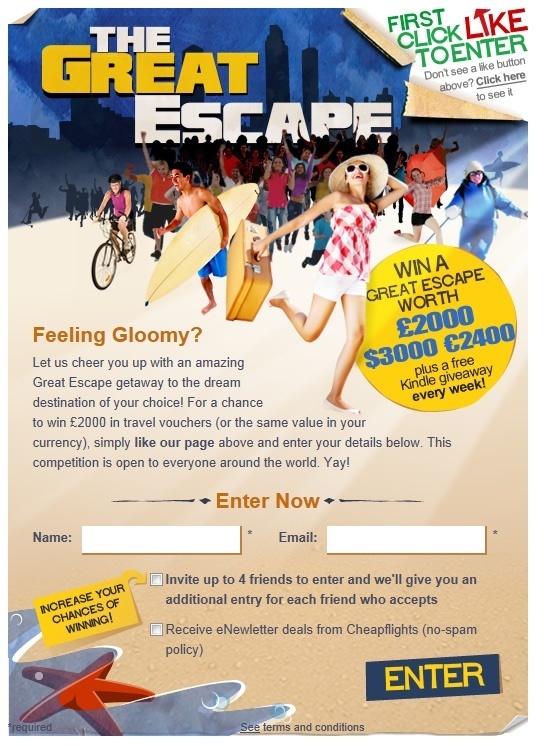 In order to participate, entrants must “like” the Cheapflights page on facebook www.facebook.com/cheapflights, and enter their name and a valid email address. The closing date for entries is Friday 17th February 2012 at 16:00 GMT. Entries received after this date and time will not be accepted. The promoter of this competition is Cheapflights Media Limited, Control Tower, One Alfred Place, London, WC1E 7EB. This promotion is open to global entrants aged 18 years and over. Employees of the promoter and members of their immediate families (including any live-in partner), its agencies, or anyone professionally associated with the promotion are excluded from entering the promotion. The promoter reserves the right to verify the eligibility of entrants. There is one grand prize of £2,000 (two thousand pounds sterling or the equivalent monetary value in the winner’s local currency). The grand prize winner will be sent a cheque for the full amount of £2,000 (two thousand pounds sterling or the equivalent monetary value in the winner’s local currency) within six weeks of the final draw date. The winner will be able to book travel with this money directly. The promoter will not be responsible for booking or arranging travel. All additional expenses incurred are the responsibility of the prize winner and it is the winner's and his/her companions’ responsibility to supply valid passports, visa and vaccinations as appropriate. The promoter strongly advises all travellers to take out valid travel insurance. There are three smaller prizes of £100 (one hundred pounds sterling or the equivalent monetary value in the winner’s local currency) in Amazon vouchers. The winners will be able to order their Kindle e-book reader online directly using their local Amazon website. The promoter assumes no responsibility ordering or delivery thereof the Kindle e-Book reader or any of the processes of the Amazon website. The final draw for the grand prize will take place on Wednesday 22nd February 2012 at 13:00 GMT. The winner will be notified within one week of the draw, by email. The prize winner is required to accept his/her prize by email within ten days of notification. In the event of non-acceptance, a supplementary winner may be drawn at the promoter's discretion. One winner will be selected each week for the three Amazon voucher prizes on Friday 27th January 2012 at 13:00 GMT, Friday 3rd February 2012 at 13:00 GMT and Friday 10th February 2012 at 13:00 GMT. The winners will be notified within a week of the draw, by email. The prize winner is required to accept his/her prize by email within ten days of notification. In the event of non-acceptance, a supplementary winner may be drawn at the promoter's discretion. The prize winner may be required to participate in publicity accompanying or resulting from this promotion. The winner's name and photo will be made available upon request and winners may be displayed on the Cheapflights facebook page. The promoter reserves the right to amend the specification of the prize or offer an alternative prize of equal or greater value. The promoter shall be entitled to terminate or modify the promotion or to modify these rules at any time prior to the closing date by publishing any such modification or termination on any website operated by the promoter. In the event of a dispute, the decision of the promoter shall be final and binding, and no correspondence will be entered into. The prize winner will be awarded on a fair and random basis and the prize has been made available for distribution. This free prize draw is promoted across other websites. Participants can also enter by email by sending their name and the email address they would like to be contacted on to facebook@cheapflights.com. The terms and conditions of entry via facebook or via email are the same. The promoter is not responsible for contacting or forwarding prizes to entrants who provide unclear or incomplete information or for entries lost, misdirected, delayed or destroyed.